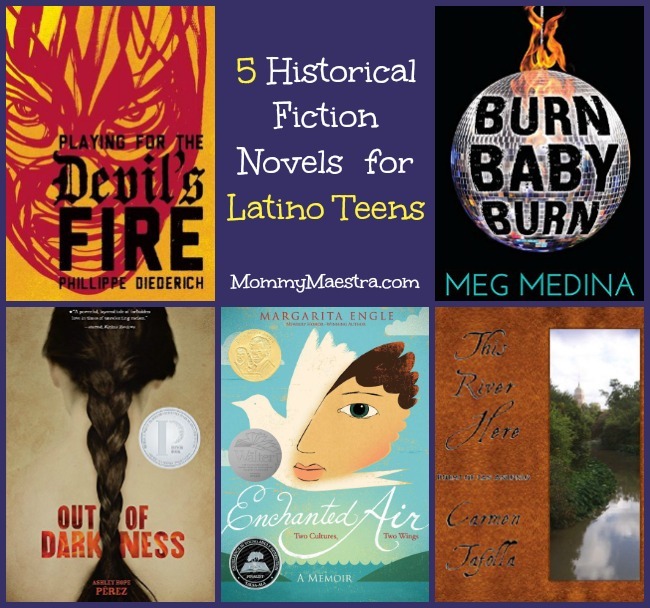 I'm delighted today to share some wonderful titles specifically for Latino teens. These historical fiction novels reveal the good, the bad, and the ugly. The writing is incredible and all of them are prize-worthy works. Note: The following titles are written for teens and adults. They may contain adult language and situations. Parents are advised to read the books themselves first before sharing with their children. This post uses affiliate links. A grim and violent depiction of the terror the drug cartel wreaks on communities, Playing for the Devil's Fire is a fictional account of one boy's valiant attempt to save his town. Thirteen-year-old Boli and his friends are deep in the middle of a game of marbles. An older boy named Mosca has won the prized Devil's Fire marble. His pals are jealous and want to win it away from him. This is Izayoc, the place of tears, a small pueblo in a tiny valley west of Mexico City where nothing much happens. It's a typical hot Sunday morning except that on the way to church, someone discovers the severed head of Enrique Quintanilla propped on the ledge of one of the cement planters in the plaza and everything changes. Not apocalyptic changes, like phalanxes of men riding on horses with stingers for tails, but subtle ones: poor neighbors turning up with brand-new SUVs, pimpled teens with fancy girls hanging off them. Boli's parents leave for Toluca and don't arrive at their destination. No one will talk about it. A washed out masked wrestler turns up one day, a man only interested in finding his next meal. Boli hopes to inspire the luchador to set out with him to find his parents. Burn Baby Burn is a coming-of-age story of a young woman who must face the turbulence in her city and her own home. Nora Lopez is seventeen during the infamous New York summer of 1977 when the city is besieged by arson, a massive blackout, and a serial killer named Son of Sam who shoots young women on the streets. Nora’s family life isn’t going so well either: her bullying brother, Hector, is growing more threatening by the day, her mother is helpless and falling behind on the rent, and her father calls only on holidays. All Nora wants is to turn eighteen and be on her own. And while there is a cute new guy who started working with her at the deli, is dating even worth the risk when the killer likes picking off couples who stay out too late? Award-winning author Meg Medina transports us to a time when New York seemed balanced on a knife-edge, with tempers and temperatures running high, to share the story of a young woman who discovers that the greatest dangers are often closer than we like to admit — and the hardest to accept. The ill-fated love affair between two teens of different races in a town and a time when segregation rules, Out of Darkness is a powerful story. Based on the author's own childhood, Enchanted Air is the personal memoir written in verse of poet and author Margarita Engle. Sprinkled with heirloom photos, This River Here is a collection of poems sprinkled with Spanish words and filled with vivid imagery to give detailed accounts of Tafolla's family and town history.